My holiday novella, Snowbound With The CEO, is available now from your favorite e-bookstore! I can’t thank CrocoDesigns enough for my new look! If you’re looking for my blog, there’s a link at the top of the page. And check out the new “by series” listing of my books! Hey, Goodreads members, there are giveaways this month! Chances to win 25 copies of LOVE A LITTLE SIDEWAYS and 25 copies of the HOLIDAY KISSES anthology! 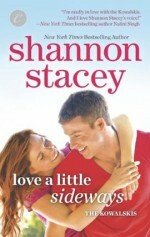 ENTER TO WIN Love a Little Sideways! ENTER TO WIN Holiday Kisses! The first chapter of LOVE A LITTLE SIDEWAYS is up on my website! The last Kowalski’s coming home. The first chapter of SNOWBOUND WITH THE CEO is up on my website!